Too often, the musician instruments makers and the musicians belong to distant worlds, which turns opaque for one, the practice of the other. Working with Pauline in implementing the production of an “ideal” sound is an very enriching, fun and inspiring experience. What offers Syos, except for the wonderful opportunity of a custom-made mouthpiece, is a fascinating process of exchange, definition, experiment, adjustment, which accompanies the building of the mouthpiece and turns it into a very privileged moment for every musician. The sound of Pierre-Antoine Badaroux is full, neither too dark neither too bright, and keep the balance between softness and power. The mouthpiece we created for Pierre-Antoine gives him the possibility to deploy easily this timbre in all the registers of the alto. 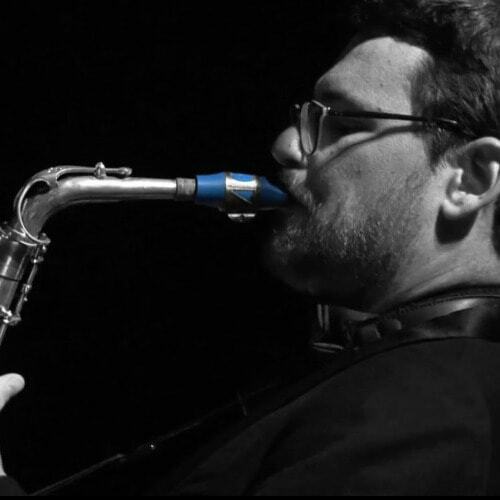 Pierre-Antoine Badaroux, saxophone player, composer, producer and teacher, is an active member of european contemporary musics. His work focuses on an exploration of the relationships between music writing, composition, predefined, undefined and improvised forms. compositeur, producteur et enseignant, est un membre actif des musiques contemporaines européennes. Son travail s'axe autour d'une exploration des rapports entre les formes d'écriture, de composition, de prédéfini, d'indéfini et d'improvisé. All those concerns are deeply rooted inside his multiple productions: as a performer in the Hodos ensemble, a composer in his sextet, a solo improviser, an archivist as producer and member of Umlaut Records label, a teacher at Lille conservatory, a be-bop deconstruction worker with Peeping Tom quartet or a rebuilder of the music and dance from the 30s with the Umlaut Big Band.